Compression, spark and HCCI ignition. Click to enlarge. GM is working with supplier Robert Bosch and Stanford University to accelerate development of HCCI (homogeneous charge compression ignition—earlier post) engines with a three-year, $2.5-million research program announced today. GM estimates that HCCI, which can use a range of fuels including but not limited to gasoline and diesel, could enable the improvement of gasoline-engine fuel efficiency by 20%, while achieving near-zero oxide of nitrogen (NOx) emissions and particulates—contributors to ozone depletion and smog. 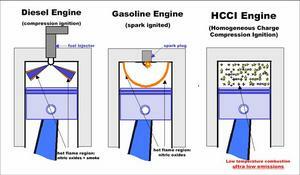 HCCI relies upon a very lean (high proportion of air to fuel) and well-mixed (Homogeneous) air-fuel mixture (Charge) that is compressed (Compression) until it autoignites (Ignition). The resulting spontaneous burn produces a flameless energy release in a large zone almost simultaneously—very different than the spark/gasoline burn or the compression/diesel burn. HCCI operates at a lower temperature—that lower temperature combined with a higher mixture of air to fuel virtually eliminates nitrogen oxide emissions and lower throttling losses, leading to a significant reduction in fuel consumption. It is GM’s goal to develop and demonstrate the viability of HCCI—a clean, efficient combustion process—within the next few years. The joint program will allow us to expand the scope of controls, sensors, and actuators work beyond what we’re already doing toward this goal. ...gasoline engines could achieve 80% of diesel engine efficiency for about 50% of the cost. HCCI is not a new concept—but the precise control of combustion under different operating conditions and fuel qualities required to make it successful has been extremely difficult. It is only with the ongoing advances in sensors, actuators and control systems and software that the prospect of commercializing HCCI is coming closer to fruition. Bosch’s role in this partnership will be to focus on those control systems, sensors and actuators. [HCCI] is simply a better way to combust, providing large gains in fuel economy. Due to the “cold” HCCI combustion, engine raw emissions can be drastically reduced, offering the potential to meet emission standards with a cost-effective three-way catalyst. However, stable and satisfactory operation of an HCCI engine is not possible without further development and sophistication of sensors, actuators and feedback control systems. The goal at the end of the day will be to suggest a complete engine controls solution that is both robust and cost effective. The Bosch Group, specifically the Bosch Research and Technology Center (Bosch RTC) in Palo Alto, CA, in conjunction with Stanford, have already been working on advanced system technology for HCCI combustion control. During the same timeframe, GM's global research and development team, in cooperation with a number of other universities and suppliers in both North America and Europe, has developed an HCCI combustion system concept, base engine architecture, and operating strategy that allows the operation of HCCI over a broad engine speed and load range. The interaction between industrial and academic researchers is central to this project. Stanford’s real strength is the ability to offer new perspectives on problems. In the case of HCCI, we have demonstrated how the physics of combustion can be used as a model for the control system, tightly linking the fields of combustion and control. Commercial deployment of HCCI is some years away—but once the basics are developed, the engines will appear in a range of vehicles, including hybrids. He was featured in an article in Popular Science and won an Innovator of the Year award in 2004. HCCI efficiencies are going to vary, but the broad stroke that GM, Bosch and Stanford put out this morning of a 20% improvement in fuel consumption for gasoline engines (i.e., giving gasoline engines more the efficiency of a diesel) seems pretty consistent within the different sources. From what I can tell from Somender Singh’s site, it’s still relatively early days in terms of figuring out exactly what is going on in his grooved cylinders--even to the level of whether or not emissions are made worse (as the Briggs & Stratton test seemed to imply), much less coming up with a set of percentage improvements across engine platforms to use as a baseline for comparison. I’m glad Tata Motors and the unnamed diesel manufacturer are engaging in further testing. If it pans out, it would be of great application in a retrofit market, as well as new engine systems. Singh's grooves will increase the surface area of the combustion chamber and thus the heat losses. He may be a charlatain or he may be the victim of his own measurement error, but I'll bet that his results are illusory either way. Presentations on in-cylinder combustion have always stressed the needs for turbulence to accelerate the process. When some unknown Charlatan comes up with a simple design to prmote turbulence followed by multiflame front propagation - The world of combustion dismisses the idea in its infancy. On the other hand the Patent Offices see it as a new idea due to its novelty and award a Title : Design to improve turbulence in combustion chambers US 6237579 - probably this is what limits the industry from .......? HCCI claims simultaneous combustion that equals detonation over a wide range of operation cycle after cycle. I am sure the HCCI design will also benefit from Mr. Singh's turbulence as fuel alone cannot detonate nor the air surrounding it - unless the two are in perfect harmony and mix. I wish somebody sponsors Mr. Singh's idea for proper evaluation ( under his guidence ofcourse ) to study the merits of his conversions on existing petrol and diesel engines. If we do not attempt to save on oil consumptions - it will be gone for ever. I have tested Somender Singh's invention on numerous small block Chevy engines over the last several months. All of his claims can be proven with minimal engine modifications. I have been modifying engines for 30 years; I have never seen a single modification have such a huge impact on engine performance and efficiency. Most modifications are focused on cylinder filling or changing the RPM range of engine operation. Now we have a simple modification that can drastically improve combustion. A new day has come. I believe the groves described in Somender’s patent and displayed on www.somender-singh.com would enable the target 20% improvement of present day gasoline-engine fuel efficiency. This can be accomplished today with present technology with out spending the 12.4 million. Not that I think the HCCI concept doesn’t deserve the attention. If I understand the concept correctly it incorporates compression ignition that will rely on higher compression ratios. With the higher compression improved turbulence will be required. This makes the HCCI concept and the grooved cylinder head concept a perfect match. The grooved cylinder head technology can be implemented now by retrofitting existing vehicles as well as including the design during the vehicle manufacturing process. I’m currently doing the modification on a small scale here in the USA. I like this hcci stuff, but what about my dodge? So far nobody has put the Singh Groove on a dyno. Brigg N Stratton doesn't really count for Hemi application, sorry. As for those results, why is the fuel consumption lower while the NOx is higher? Doesn't this indicate *cleaner* burn? Looks like a bunch of modified cars, only a few by automotivebreath, none by engineer-poet, and nary a negatve word. Not one. Can HCCI start an 89 Celica in second gear from a dead stop? SOMETHING is going on, and it DIDN'T cost 14 Mil. Have Hotrod or carcraft test the groves, They have dynos and are about low buck bolt ons. Not sure why they havent. We have a couple memebers running them at fueleconomytips.com and so far all results are positive. We've been testing it at fueleconomytips.com and mpgresearch.com thus far all results are positive. Currently running on a couple of turbo 4 cylinders, and a 350 Suburban. In process of modding a Saturn head for Tour De Sol competition. If doing a rebuild or other head work it is probably the most cost effective modification I've ever seen. As time goes on I will be using this on all of my engines from lawn mower on up. It appears the people at Fuel Economy Tips.com are making great progress with Somender’s groove concept. Here's a quote from one of the active members. "A grooved head I shipped to Florida is finally getting dialed in. '89 LeBaron, 2.5 S-50 turbo, Spearco IC, +40 injectors, & custom cal. Stock mileage was 23/27 mpg. He is now seeing 35/42 mpg! Stock HP was 152 crank. He isn't quite sure where he's at, but it's in the neighborhood of 400 HP! HE'S RUNNING 30 PSI BOOST ON 93 OCTANE PUMP GAS WITH ONLY WATER INJECTION ADDED FOR DETONATION CONTROL!!!!" You know, Somender Singh's invention WAS granted a U.S. patent back in 1999. One year after Popular Science writes their article, General Motors announces this sort of thing? Considering that both inventions claim an increase in fuel economy of around 20%, I'm also curious as to what the hell is going on. Here's a shop in PA that can do the somender grooves (with his blessing) and other mods that compliment them. Power, mileage and driveability are vastly improved. I've done the grooves on a Turbo Charged 89 Nissan Maxima 3.0 VG. I have pictures of the grooves for those interested. The grooves were done at 199,000miles. I now have 226,000miles. The car runs 13.40@107mph in the 1/4mi I get about the same MPG as before I turbo charged it 21-22mpg in town and 26-28highway. I have the fuel curve set safe. It's the only car I've ever been able to hold on to the downpipe(exhaust) at idle. You can let it idle for hours.. it still won't burn you. It's warm but NOT HOT. You said that the MPG didn't change? Please, post those pics to my email or on here. GM fights the inertia of a huge corporation. There are plenty of autos with power and fuel efficiency outside of the United States... to include the GM Opel. In that statement keep in mind that my Nissan Maxima was NOT turbocharged from the factory. The Sticker for MPG is 19/24. And the car's performance stat's are 16.50's 1/4mi. I get better gas mileage and have over doubled my Horse Power from stock with a turbo and Grooves. I beleive the grooves supress detonation and increase combustion chamber effecency. My current summer driver is a 86 Camaro with 87 Buick Grand National Turbo V6. It run 10.32@133mph 1/4mi gets 20mpg and has the grooves. EVERYTHING that I put together gets's grooves. Period.